Hello friends! 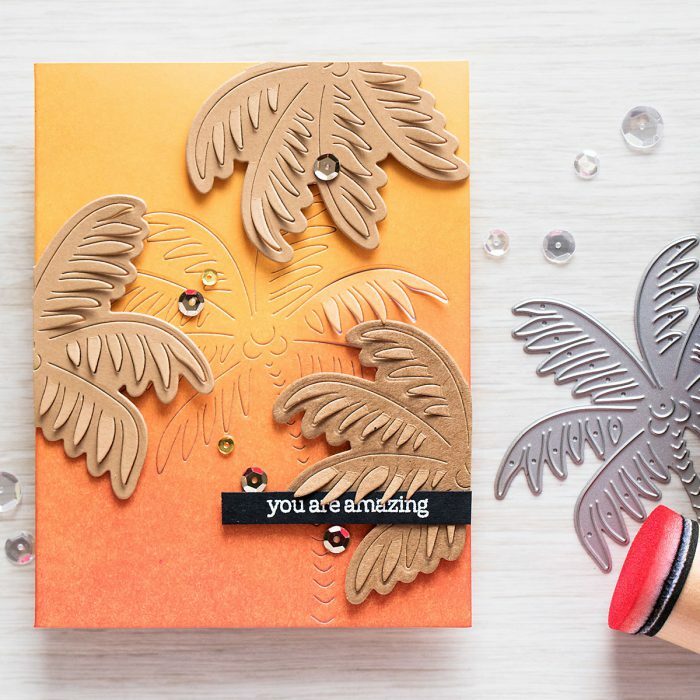 I have a fun summery card up on Hero Arts blog featuring the Palm Tree Paper Layering die and I also have one more card using the identical die to share here for more inspiration. I’ve been playing a lot with Hero Paper Layering dies in the past couple of weeks and I really love how there’s an actual die and a frame, this gives a lot more options and I am exploring those options in both of my blog posts today. 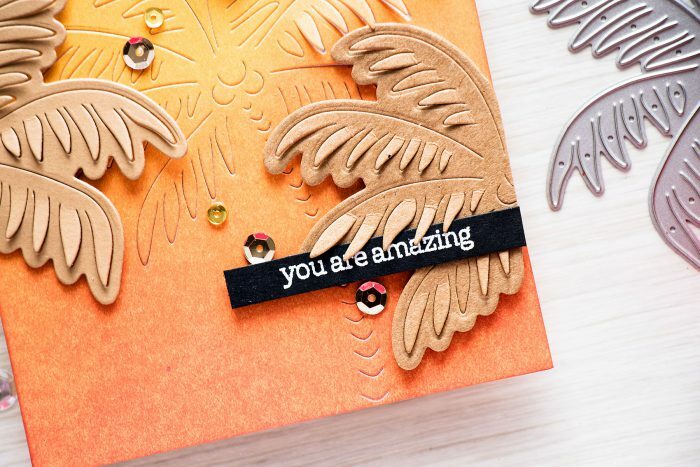 So there are two ways one can use Paper Layering dies (three actually, but I am only showing 2 here) – to create a die cut (by using both the inner and frame die) and to make a partial cut in the background (by using just the inner die). I was always using the inner die and making partial cuts in panel that was later adhered onto a card base (like I did here and here), but you can actually go ahead and use it directly on the card base, this makes a unique cut that you can see from the inside when you open the card. 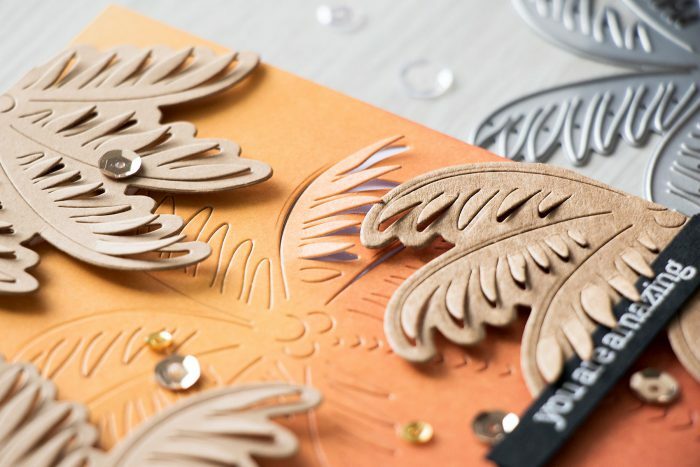 No dies (that I know of) do this and I’m really excited to keep exploring this option further, I look forward to making some postcard-type cards with a partially cut palm tree and pineapple. I discovered another fun technique (not related to Paper Layering) completely by accident and thanks to my laziness – I wanted to make an ink blended sunset background, but I didn’t want to have to blend the entire card front (it does take quite a bit of time to blend it). So instead of starting with white cardstock and having to add a base yellow layer I started with a yellow card base. So simple and so much easier and faster, I only had to blend two colors to create the look I was going for and it took me less than 10 minutes, maybe even less than 5. 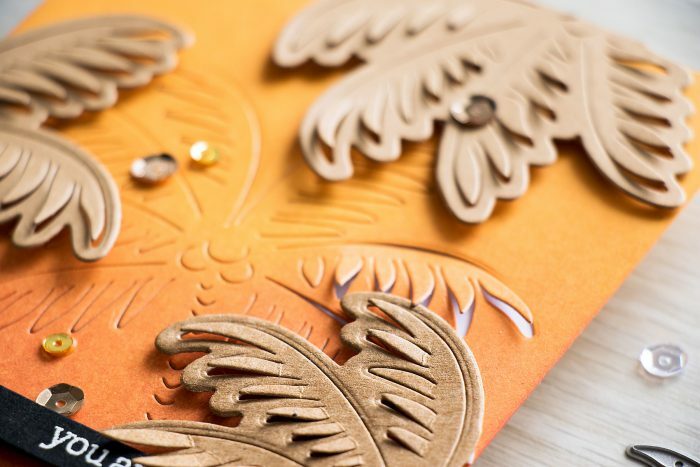 To finish this card I added You Are Amazing sentiment heat embossed in white over black cardstock and adhered several brown and gold sequins to imitate coconuts. 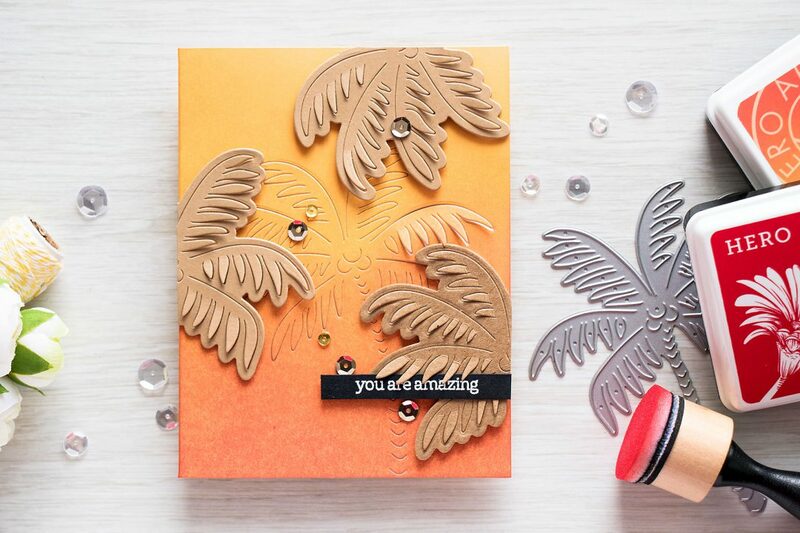 For another idea on how to use the Palm Tree die please visit Hero Arts blog. This is so cute. I love the sequins you added. Beautiful colors. Wonderful cards Yana! Thanks for the ink blending tip. Oh my, Yana, what a beautiful colour combination! I love this! Oh wow… This card is so hot (flame emoji here). Amazing background! So sweet and I love your sample “Just Breathe” on the Hero Arts blog. So colorful and happy! Your creations make me happy!